We supply Litter picker for collecting plastic bags, bottles, and can pick up to 1 kg. This is imported from europe and delivery any where in India. Enquiries from waste management companies welcome. Very useful in picking-up littered paper-plastic and other waste from premises. It can be operated by leverage in the standing position. Just pick-n-drop in the bin, making the process fast and tireless. 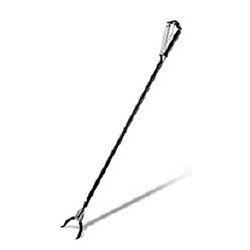 Picking up and gathering road side or floor litters is no easier with out Litter Picking Tool. Waste Picker is very useful in picking-up littered paper-plastic in hospitals, hotels, marriage halls, party plots & garden lawn. It can be operated by leverage in the standing position. Just pick-n-drop in the bin, it’ll make the process 100 time fast and tireless. Specifications Strong internal metal bar ensures reliable long-term performance. - 360º rotating head for high flexibility and easy reach. Very useful for picking-up littered paper-plastic in hospitals, hotels, marriage halls, party plots & garden lawn. Can be operated by leverage, in the standing position. Just pick-n-drop in the bin. Making the process 100 time fast and tireless. Very useful in picking-up littered paper-plastic and other waste from premises. It can be operated by leverage in the standing position. Just pick-n-drop in the bin, it’ll make the process fast and tireless. o complete the varied necessities of our clientele in best possible way, we are involved in providing a broad series of Pet Waste Picker. The offered litter picker is a battery operated, urban waste cleaner capable of vacuuming up every possible kind of litter such as papers, cigarette packets, cigarette butts (completely extinguished), animals dropping, beverage cans & bottles, plastic bags & fallen leaves etc, found on pavements & road shoulders. - No bending – no backache.